« twittens - now in pink! It has been quite a year here at twittens HQ. To think a year ago today there were only a few pairs of twittens in existence - all prototypes. The general idea was that it was too late to put them into production for last year ... and this year would in fact be our first season. As the 1000s of you know who bought twittens last year, things didn't quite work out that way. Due simply to demand the manufacturer (Impacto) worked hard to put these into production and get them out to as many of you as possible. I would like to offer a heartfelt thanks to both you and them. The media coverage was incredible, as was all the positive feedback we received - wow, just wow. So, what is up for this year? Well, you will notice if you take a gander over at our "Where to Buy" section that twittens are now available at almost 200 retail outlets across Canada - with more being added almost every day. If there is not a retailer near you yet, well - we're trying our best - hopefully soon! Don't see your favourite retailer on here? Don't ask us - ASK THEM! Why not give them a copy of our brochure or simply ask them to stop by the site and check it out? There is a LOT of big news to come in the following months – so please stay tuned. While I'm still sworn to secrecy - I can at least reward you for taking the time to read this by letting you know that a new colour will be available soon. Without saying too much, I will advise this colour has been one of the most requested and will only be available online only (I think) and in a limited quantity (I know). You can certainly check back here and I’ll send out the information as soon as possible – or alternately check out the�twittens Facebook page��or even�twittens on twitter�. 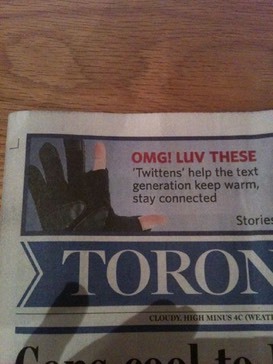 All the twittens news that is fit to print you will find there. That's all for now - but thanks so much for stopping by today and for your interest in twittens. Feel free to contact us anytime for information, questions or concerns. Just head on over to the Contact section - we love talking twittens! Stay warm my friends - and all the best!